Inspired by our trivia-loving friends at 826DC and 826NYC, 826CHI's Trivia for Cheaters is a trivia competition that invites you to cheat with creativity and too much zeal in the name of supporting 826CHI's mission to amplify Chicago's youth voices. Join us on Friday, February 15th from 6-8pm at McDonald's Headquarters on 110 N. Carpenter Street for a trivia challenge for the ages! 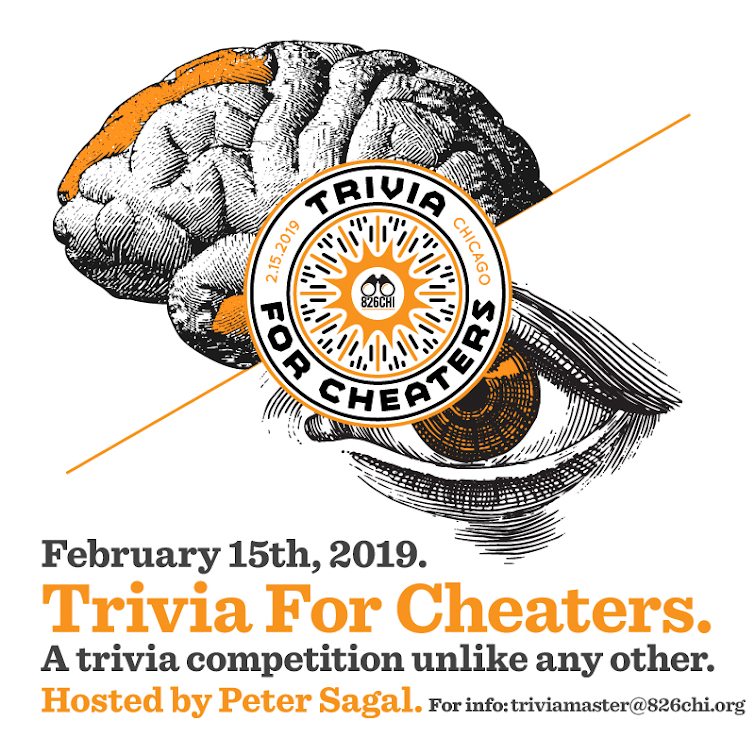 Assemble your smartest, most devious acquaintances to contend for an obscenely gigantic trophy and bragging rights as Chicago's best cheating trivia team while crossing off "be in a game show with Wait, Wait Don't Tell Me's host, Peter Sagal" from your bucket list. Tap your friends, family, corporate matches, and social media networks to contribute to your team's cause, and you'll unlock powerful cheats to be used against other teams during the game. Sign up your team here. The top fundraising team will receive the prized Immunity Cheat, a one-time ability to dodge a cheat from another team. All funds raised support 826CHI. 826CHI is a non-profit organization dedicated to supporting students ages 6 to 18 with their creative and expository writing skills, and to helping teachers inspire their students to write. The organization serves 3,500 students annually and nurtures partnerships with teachers across Chicago Public Schools. Every dollar donated to this fundraiser allows 826CHI to continue offering literary arts programming 100% free-of-cost to Chicago youth.